See in Glossary should and should not collide with each other. This is particularly useful when there are many Colliders in your Scene, or if the Render and Collision Meshes are out of sync. For further guidance on improving physics performance in your project, see documentation on the Physics Profiler. To open the Physics Debug window in the Unity Editor, go to Window > Analysis > Physics Debugger. From this window, you can customize visual settings and specify the types of GameObjects you want to see or hide in the visualizer. Hide Selected Items is the default mode. This means that every item appears in the visualizer, and you need to tick the checkbox for each item to hide it. To change this to Show Selected Items, use the drop-down at the top of the window. This means that no items appear in the visualizer, and you need to tick the checkbox for each item to display it. Reset Click this button to reset the Physics Debug window back to default settings. Hide Static Colliders Tick this checkbox to remove static Colliders (Colliders with no Rigidbody component) from the visualization. Hide Triggers Tick this checkbox to remove Colliders that are also Triggers from the visualization. Hide Rigidbodies Tick this checkbox to remove Rigidbody components from the visualization. Hide Kinematic Bodies Tick this checkbox to remove Colliders with Kinematic Rigidbody components (which are not controlled by the physics engine) from the visualization. See documentation on Rigidbody components for more details. See in Glossary components (which are not currently engaging with the physics engine) from the visualization. See documentation on Rigidbody components: Sleeping for more details. Collider Types Use these options to remove specific Collider types from the physics visualization. See in Glossary from the visualization. (concave) Tick this checkbox to remove concave Mesh Colliders from the visualization. Hide None Click Hide None to clear all filtering criteria and display all Collider types in the visualization. Hide All Click Hide All to enable all filters and remove all Collider types from the visualization. 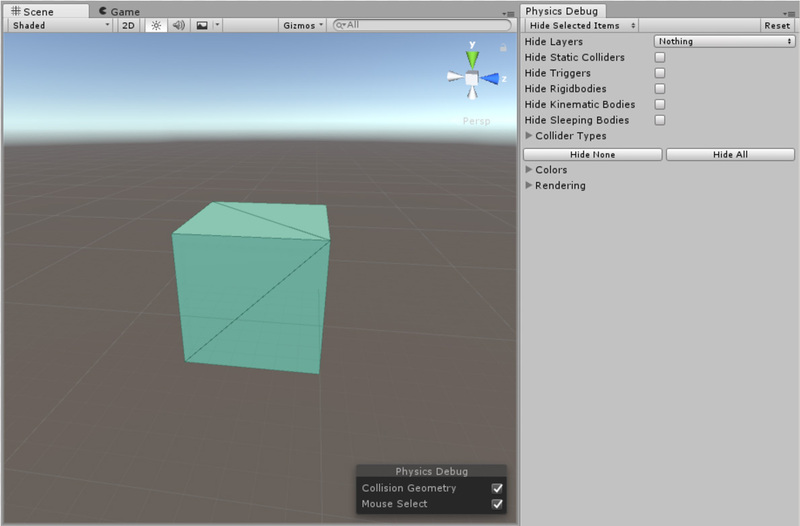 Colors Use these settings to define how Unity displays physics components in the visualization. Colliders Use this color selector to define which color indicates static Colliders (Colliders with no Rigidbody component) in the visualization. Triggers Use this color selector to define which color indicates Colliders that are also Triggers in the visualization. Rigidbodies Use this color selector to define which color indicates Rigidbody components in the visualization. Bodies Use this color selector to define which color indicates Kinematic Rigidbody components (which are not controlled by the physics engine) from the visualization. See documentation on Rigidbody components for more details. Bodies Use this color selector to define which color indicates Sleeping Rigidbody components (which are not currently engaging with the physics engine) from the visualization. See documentation on Rigidbody components: Sleeping for more details. Variation Use the slider to set a value between 0 and 1. This defines how much of your chose color blends with a random color. 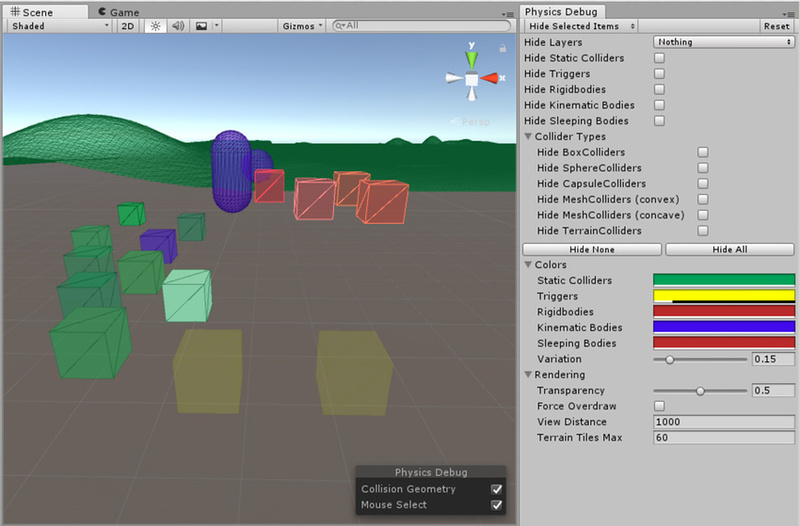 Use this to visually separate Colliders by color, and to see the structure of the GameObjects. See in Glossary Use these settings to define how Unity renders and displays the physics visualization. See in Glossary geometry in the visualization. Overdraw Normal render geometry can sometimes obscure Colliders (for example, a Mesh Collider plane underneath a floor).Tick the Force Overdraw checkbox to make the visualization renderer draw Collider geometry on top of render geometry. Distance Use this to set the view distance of the visualization. Tiles Max Use this to set the maximum number of Terrain tiles in the visualization. Collision Geometry Tick this checkbox to enable collision geometry visualization. Mouse Select Tick this checkbox to enable mouse-over highlighting and mouse selection. This can be useful if you have large GameObjects obstructing each other in the visualizer. To see active Rigidbody components only: To see only the Rigidbody components that are active and therefore using CPU/GPU resources, tick Hide Static Colliders and Hide Sleeping Bodies. See in Glossary Colliders only: Non-convex (triangle-based) Mesh Colliders tend to generate the most contacts when their attached Rigidbody components are very near a collision with another Rigidbody or Collider. To visualize only the non-convex Mesh Colliders, set the window to Show Selected Items mode, click the Select None button, then tick the Show MeshColliders (concave) checkbox.